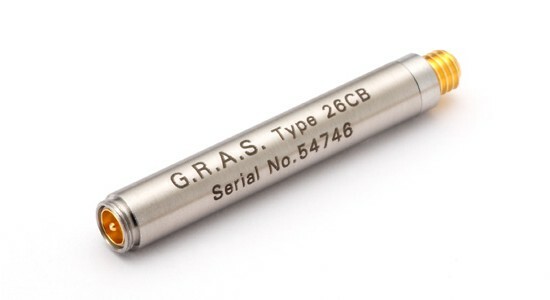 Its small ceramic thick-film substrate has a very high input impedance and is shielded by a guardring to minimize the influence of stray capacitance and microphonic interference.The G.R.A.S. 26CB is delivered with a built-in TEDS chip and can be programmed as a single unit with a microphone fitted. It can be used with all prepolarized microphone cartridges, such as G.R.A.S. 40BE and 40BD 1/4″ microphone and G.R.A.S. 40AE, 40AD, and 40AQ 1/2″ microphones using the included G.R.A.S. GR0010 Adapter for 1/4″ preamplifier and 1/2″ microphone. It has an integrated Microdot output connector. The casing is made of stainless steel for maximum strength and durability. Get in touch to book the 26CB Standard Preamplifier.